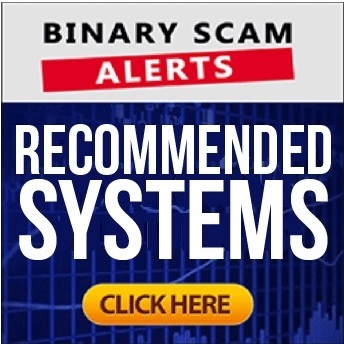 Binary Scam Alerts is posting an immediate SCAM review and BLACKLIST notification in regards to the Fintech LTD software, app, and auto-trader as well as Daniel Roberts the fake actor and cheater. We received a handful of complaints from our UK members about fake reviews and grossly misleading emails that have penetrated the SPAM filters and lured innocent day traders into funding broker accounts under false pretenses using images stolen without permission. 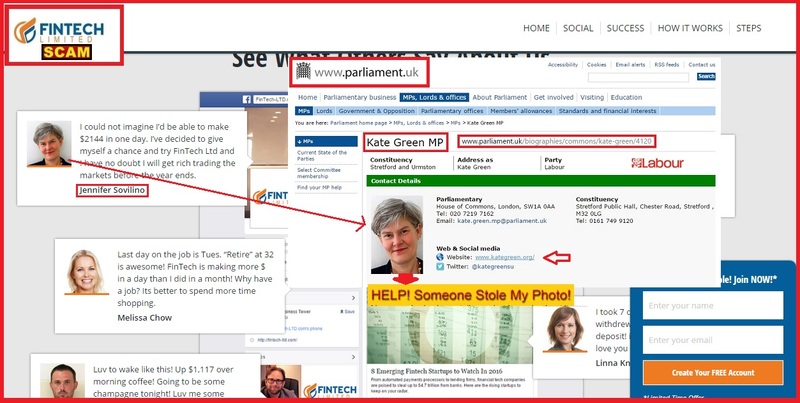 This time these fraudsters stole the picture of a the UK Parliament Member. We have therefore arisen to the challenge and conducted a full investigation into this system, and our findings are clear, conclusive and leave no room for mistakes or hesitation. Fintech LTD is a confirmed binary options investment SCAM which will steal your money. This time we will not be able to get it back for you, so don’t say we didn’t warn you. Below you will see a picture of “Jennifer Sovilino” giving a fake testimonial saying “I could not imagine I’d be able to make $2144 in one day. I’ve decided to give myself a chance and try FinTech Ltd and I have no doubt I will get rich trading the markets before the year ends.” In reality these imbeciles have ripped of the photo of a very distinguished member of the UK Parliament named Kate Green who happens to be Shadow Minister for Women and Equalities (ouch). If this is getting you angry feel free to contact her at the House of Commons, London, SW1A 0AA, Email: [email protected] and show everyone you know these cyber-criminals have taken it too far this time. If you have found this to be exceptionally disturbing, you are welcome to contact her directly via phone at Tel: 020 7219 7162 and leave a message with a link to this post. Below you will find an image of Oldmansteve. He is a slimy Fiverr.com actor who will sell his right kidney for a bottle of cheap rum. I’m sure the Right Honourable friend from the House of Commons would be more than delighted to know her picture is being proudly displayed next to this thieving little actor in the most blatant and sleazy manner. As the story goes, FinTech Ltd, owned and managed by the “Daniel Roberts” had an epiphany after one of his employees named Ben got into some financial difficulties and started defaulting on his mortgage installments. He then apparently realized his technological skills could be put to use in the stock market, and that’s when they developed the software which as seen below has a zero level of transparency. All you can see is the broker which has been assigned to you, and a messaging page that tells you to fund your account before you can even see the software. These guys have reached an all time low and a bit of common sense not to mention decency would have saved them a pretty penny, but they chose to do the crime so now it’s time to pay for it. Moving forward, if you are under some kind of misconception that using strategies like scalping, or technical analysis in the form of candle sticks or bolinger bands will help you achieve that ~85% ITM ratio you are either in denial or have failed to understand the severity of the situation. Your best bet is to collect whatever is left of your initial investment and cash out as fast as you can. Not really. It’s going to cost you at least $250 at Fintech LTD and this money will be paid through one of the recommended brokers in their members area. Please make sure to keep your distance from the Free Money System, Lie Detector Millionaire, Disrupt Trading, Push Money App, Binary Matrix Pro, the Drexel Code, Amissio Formula, Quick Cash System, and Millionaire Blue Print. Don’t say we didn’t warn you because recently we’ve been having serious issues retrieving stolen money from rogue brokers. We have developed a very rigid credibility test and a set of procedures designed to prod at and tear down anything remotely resembling a fraud. Transparency, accuracy, performance, and customer service are key here. Only systems showcased in our recommended section have passed our due diligence and are endorsed. The Fintech LTD software, App, and auto-trader as well as Daniel Roberts the Fake CEO and owner is a verified binary options investment scam. There is not one thing which is genuine, honest, or sincere about this system and it will steal your money in a New York minute. We are warning all our members to stay away from it because this time we will not be able to help you get you a refund. As always, for more information please make sure to join our Facebook Group and subscribe to our YouTube Channel.